Sorry for delay but today…it’s been a hard day. BTW, keep on reading and talking about CISSP. Today we are here to keep on studying for the last edition of CISSP certification, the one implemented since April the 15th, 2015. Back to the topic, today I’ll write about how to CISSP with mind map. Mind maps are a wonderful idea from Tony Buzan (official site). He’s a very elegant english man who found how to apply the enormous power behind the image association. I’ve found it very useful for me as far as I’m studying law and I use to deal with books of hundreds pages. But, if you want to investigate further more, start with links I’ve provided few rows above or search for mind maps. You’ll discover a new world. 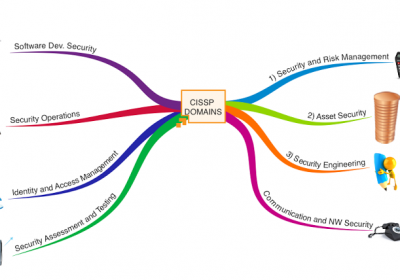 As far as CISSP certification is made up of an incredible quantity of concepts, definitions, informations and so on, there was no reason not to use mind maps. So, I’ve tried not to do a jump start, downloading the official material from CISSP (ISC)2 website. This paper is the official exam outline and it contains all the new domain with few specifications, some other info, some other details and some clue for what about the CISSP candidate will be asked for, during the exam. The first image of this post is almost self explanatory. I’ve read the topic in the exam outline paper and I’ve write down what I thought was the kernel of the domain. Reading my mind map, I’ll be able to literally “visualize” this post (I’m actually writing so…:-) and, especially, the very first MMs. So, for the first exercise, I started to MindMap all domains, trying to associate one simbol per domain. Next, I realized one mindmap for each domain with the most peculiar information extracted from the exam outline. Results are few mind maps realized to fast resume macro concepts domain per domain. As far as I’ve not been able to digitalized any MindMap the one that open the post is made with iMindMap from Tony Buzan and…actually I found no competitor to this app. Next days I’ll publish the single mindmaps for domains so, stay tuned.